Debate: Should Denial of the Holocaust be Illegal? Free speech is a complicated issue and everyone on the left side of the political spectrum is in agreement that it defines who we are as a society. In European countries, it is also part of who they are. Europe is also where the Holocaust happened. If you are not familiar with the Holocaust, you probably went to public schools. 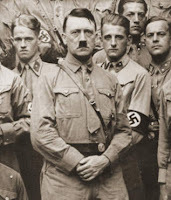 It was an event/situation in the late 30s and into the 40s where the Third Reich killed eleven million people. Almost everyone on the left side of the political spectrum thinks that this was a wrong event, but some conspiracy theorists on the right feel that the world is just wrong about the event. They think it never happened. Do they have the right to say this or does free speech collide with the standards of decency we try to hold in the enlightened world? Jake: Should the denial of the Holocaust be Illegal? Are you seriously asking me this question? Of course it should be illegal. The only kind of person who would think that denying the Holocaust should be legal is an anti-Semite. I might be a lot of things, but I'm sure as heck not a racist like Glenn. I enjoy the more mild things in life such as opium and t-bone steaks. I'm not a rabid lunatic spouting racist propaganda and if you are then you deserve to pay a $500 fine. If you want to deny the Holocaust in the privacy of your own home, that's fine, as long as me and my children don't have to hear you denying the Holocaust in public. Glenn: Jake raises several interesting points here, without being inflammatory on what is certainly a hot issue. He argues that holocaust denial is fine as long as you do it in the privacy of your own home. While I appreciate this sentiment, I think holocaust denial should be allowed out in the open just as homosexuality. While holocaust denial is a choice and homosexuality is given to you by your parents as a genetic gift, we can't outlaw either. No one LIKES holocaust deniers and least of all me. (I am half Jewish by birth.) But there are plenty of things I don't like that we can't just outlaw: post-rap, parachute pants, prayer, et cetera. 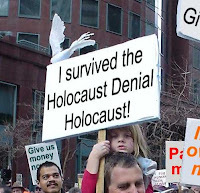 Holocaust denial is to me in the same category, especially because it's as futile as praying. The Holocaust happened and no amount of denying can change it. Jake: All things that are publicly illegal (drug use, burning a flag, murder, etc.) are harmless when committed in the privacy of your own home. If you want to teach your children that Jews and Gypsies are our inferiors that is your prerogative. If you want to publicly teach a group of children in the park that the Holocaust never happened...well buddy, now we have a big problem. We may have the freedom to say whatever we want (barring you don't say you're going to kill the president), but don't we also have the right to not hear things if we don't want to? If a record has sexual lyrics, do we not slap a sticker on the album? I'm not saying that we should slap a sticker on a anti-Semite conspiracy theorist, but I'm also not saying that it's a bad idea. Glenn: I know you said you weren't saying we should slap a sticker in a Holocaust denier, but that might be a good compromise. We can't just ban ideas from the public sphere because we don't like them. Not to mention the sentencing issue! Are you going to send someone to jail just for believing something that isn't true? If that's the case we better build a lot more jails in Utah to house all the Mormons. I prefer my jails to house white-collar criminals and rapists, not people who argue that videos from concentration camps were manipulated by Golda Meir, Harry Truman and Shel Silverstein. These people should of course be ridiculed, but with the ultimate ridicule of all: the death penalty. Let's save that for the Mormons. Jake: If anything good comes out of this debate (and I sincerely hope nothing does) it should be that Holocaust deniers are forced to wear stickers. Also, not everything that is illegal results in time in jail or prison. Denying the Holocaust could merely be a fine as I stated earlier (with the sum being $500). We could use this money to fund Holocaust museums. I know that a lot of Holocaust museums are underfunded and can't even afford to buy a lampshade made of a Jew's skin. I say that this problem (publicly denying the Holocaust) could also be the solution to a larger problem (underfunded Holocaust museums). Glenn: I never thought in my college educated life I could be convinced to support this kind of restriction on free speech, but Jake has made a point here that even a Holocaust denier or Mormon couldn't deny. I apologize for that pun but I will never apologize for Holocaust deniers. They are scum and the kind of vile lies they bring into our academic worlds and FM radios are enough to make me vomit and then convert back to Judaism. But instead of doing that I will draft an initiative to be put on the ballot here in California that would classify Holocaust denial as a class D misdemeanor, with no punishment besides having to wear a sticker saying "Grade A Mormon." Should denying it be illegal? I think the whole Holocaust should be illegal!! glenn, who are you kidding? you LOVE post-rap. this is actually a REALLY good deb8! I deny the existence of this debate.